Succulent Kokedama Kit Includes: Blond Sphagnum Moss Kokedama Coffee Spanish Moss Chartreuse Spanish Moss Succulent Soil Brown Jute Twine Hanging Chain. Kokedama literally translates to “moss ball” in Japanese! It is a tradition in Japanese gardening that wraps a plant’s root ball in moss for it to be hung or placed on a dish. Kokedamas look stunning with orchids, bromeliads, succulents, Asian plants, herbs and vines. Place them indoors or outdoors, on kitchen counters or bathroom counters, on coffee tables or dining room tables! 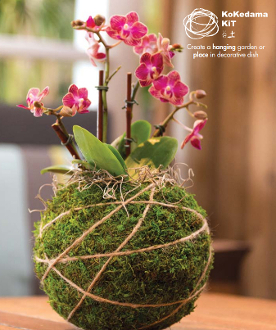 Our Kokedama Kit includes everything but the plant, so all you have to do is choose!